...Stood in awe gazing over a sparkling lake? ...Stared at a star filled night sky in wonder? ... Were not in a hurry? ...Chose what you really wanted to do or where you really wanted to go? 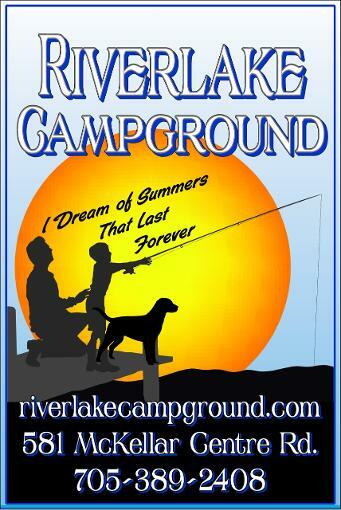 Riverlake Campground is 'that' place! Where time is in no hurry. Come discover our beautiful spacious Seasonal Trailer Sites on the Sunset Shores of Prestigious Lake Manitouwabing. Put Fishing, Boating, Swimming and Campfires on your 'to do' List. Click on the photo above for a gallery of the Park, beaches, and around Riverlake. Memories created by our guests! Come spend quality time with friends and family and enjoy the seasons at Riverlake. Relax and watch a beautiful sunset or an early morning sunrise over the lake. Or take the time and experience the wildlife.